Bananas and peanut butter. What a classic combination! Yet again, I was stuck with two lonely, overripe bananas that my husband wanted nothing to do with. I forewent the regular banana bread, and thought I’d try some muffins. 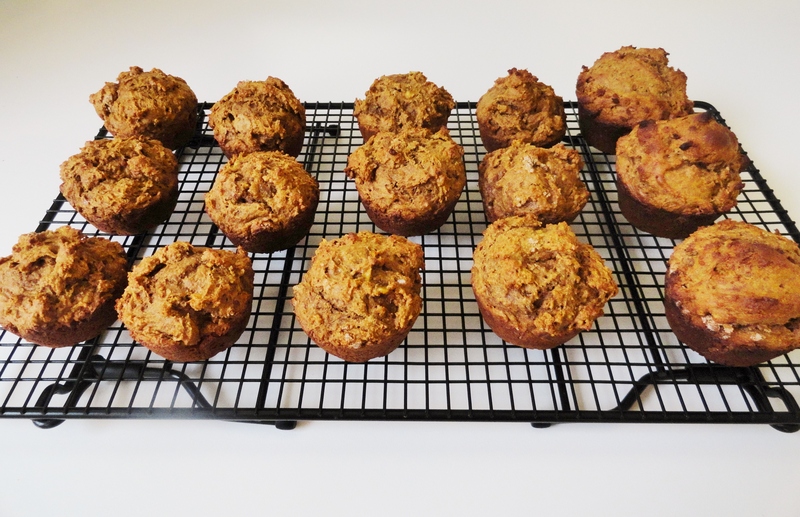 Not just banana muffins, but banana and peanut butter muffins. Yum! 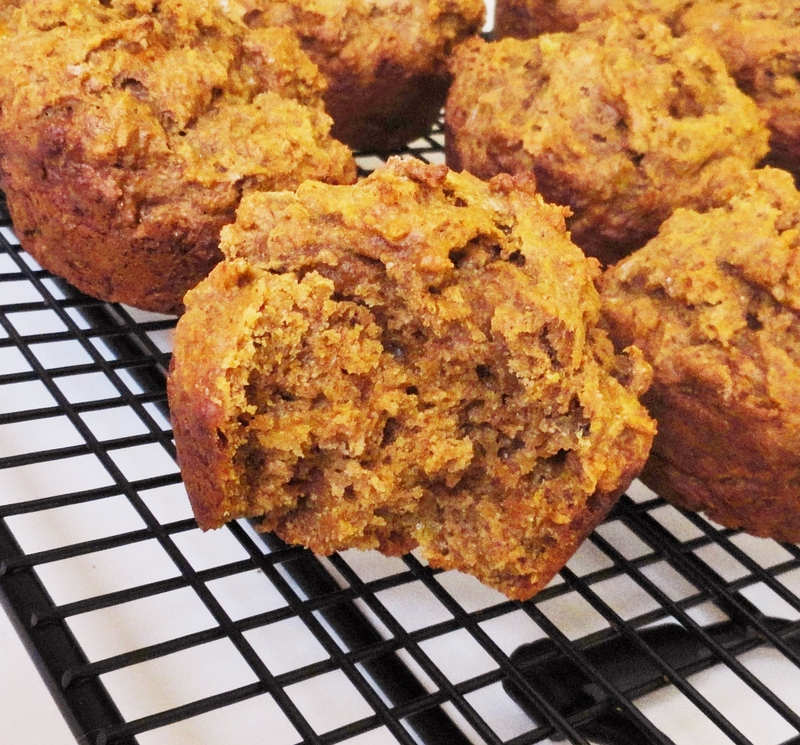 These muffins have less sugar and fat than your typical waistline-enemy, using honey and non-fat Greek yogurt. You also get a great serving of whole grains if you substitute whole grain flour for all-purpose. Sadly, the whole grain flour makes them look a little blah, but trust me, they don’t taste like it. These are pretty simple to make, and for me, I had everything required in my kitchen already. I LOVE when that happens. If you want an extra treat, melt some peanut butter to go on top of these suckers. I didn’t try it, but I’m guessing you won’t regret it! 1. Preheat oven to 425 degrees. Spray 12-count muffin pan with non-stick spray. Set aside. 2. In a medium bowl, whisk mashed bananas, honey, brown sugar, yogurt, egg and milk together until combined. Whisk in peanut butter and vanilla until smooth. Set aside. 3. In a large bowl, whisk flour, cinnamon, baking soda, baking powder and salt. Pour wet ingredients into dry ingredients, and whisk until just combined. 4. Fill muffin cups 3/4 full. Bake for 5 minutes at 425 degrees, then reduce the heat to 350 degrees and continue to bake for 12 minutes more, or until an inserted toothpick comes out clean. My hubs loves bananas, and he’ll buy them any time he goes shopping on his own (so almost never). The problem is, he won’t eat them all before they start becoming a bit…questionable. 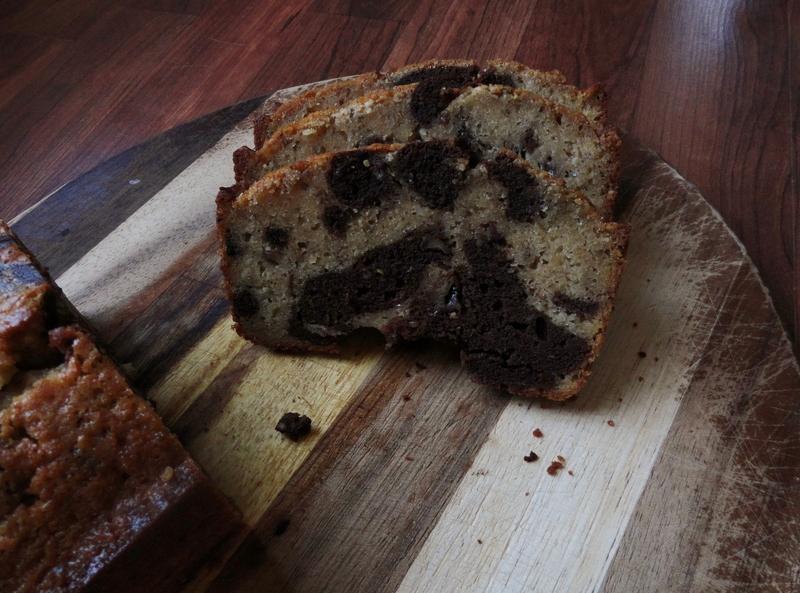 Of course, my initial go-to is banana bread, but I thought this time I’d change it up slightly. After taking a look at the ingredients in this bread, I’m not sure you could call it bread, it is basically a cake. Oh well – it’s delicious! 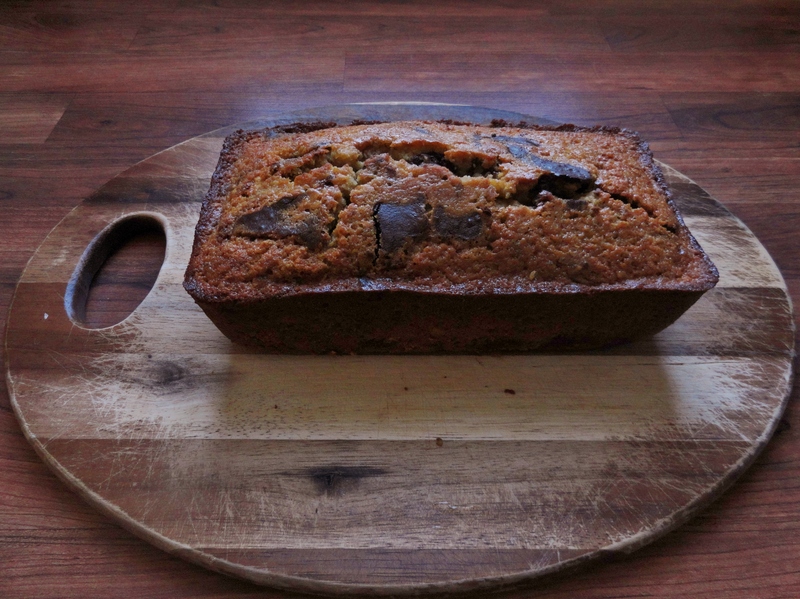 This is an excellent way to use up some old bananas, and also spice up your same old boring banana bread! 1. Preheat oven to 325 degrees. Butter or non-stick spray loaf pan, dust the inside with flour and tap out the excess. Place the pan on an insulated baking sheet or on two regular baking sheets stacked on top of the other. 2. Whisk together flour, baking powder, salt and nutmeg. 3. In a small bowl, mash the bananas with the lemon juice, zest, and rum. 5. In the bowl of a stand mixer fitted with a paddle, beat the remaining stick of butter at medium speed until creamy, about 3 minutes. Add the sugars and beat for another 2 to 3 minutes, until light and smooth. Add the eggs one at a time, beating well after each addition, then beat in the vanilla. The batter will look curdled, and it will continue to look curdled as you add ingredients. Reduce the mixer speed to low and add half the flour mixture, mixing only until it is just incorporated. With the mixer running, pour in the milk; once blended, add the remaining dry ingredients. Scrape down the bowl and mix in the mashed bananas. 6. Pour a little less than half the batter into the bowl with the melted chocolate and stir to blend. Drop alternating spoonfuls of both batters into the prepared pan. Using a table knife, swirl the batters together, taking care not to overdo it. It’s time for another bloggers choice recipe swap, and I was assigned Lindsay’s blog, Life and Kitchen. She has gone vegetarian for the year, which is super cool! I skimmed through some of her recipes, but ended up landing on honey wheat bread. That didn’t turn out so well for me (see honey wheat bread fail), so I was determined to find something else that could be a success. 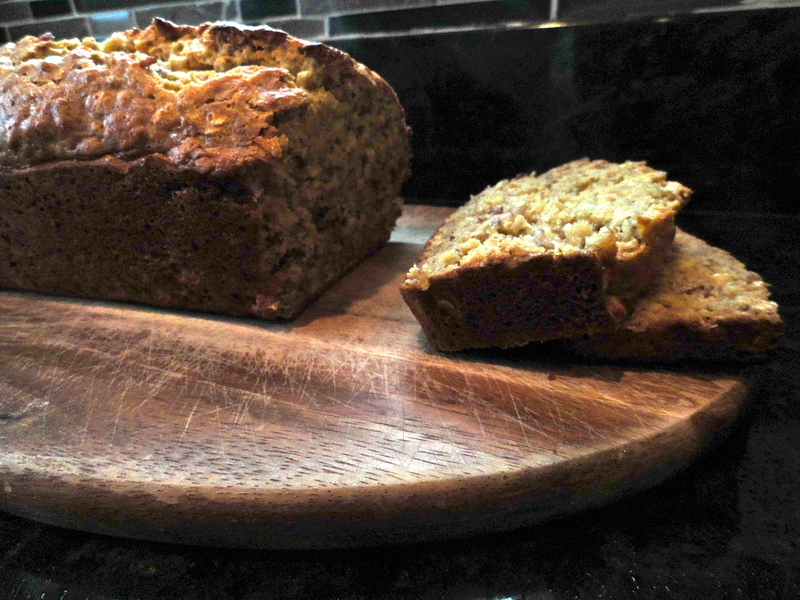 I settled on her Banana-Oatmeal Bread. 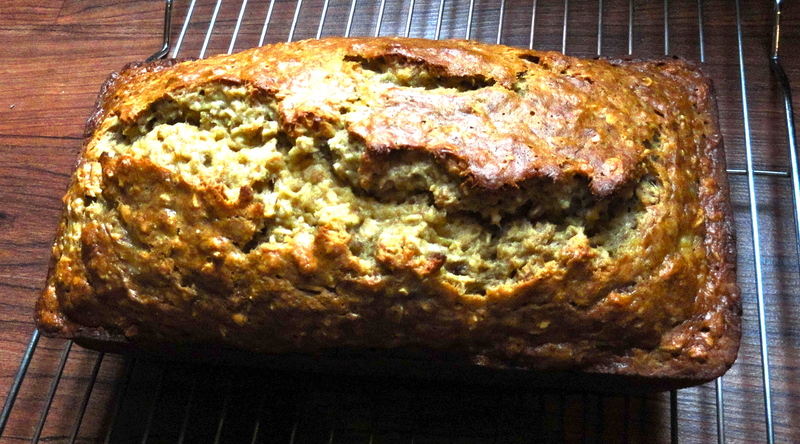 At first glance, I was concerned because there weren’t any spices in this – usually I like some nutmeg or cinnamon in my banana bread, but I still followed the recipe as is. I after combining all the ingredients, minus the bananas, I was terrified that it was far too dry for a quick bread (I was having flashbacks of the honey wheat bread disaster). However, once I smashed up the bananas and added them to the mixture, it was super moist and resembled more of what I thought it should. The result was heavenly. The bread was so super moist and had a ton of flavor, even without any spices. This might be a go-to recipe for future banana bread in this house. YUM! 1. Preheat oven to 350 degrees. In the bowl of a stand mixer, combine flour, sugar, salt, baking soda and baking powder. Add olive oil and eggs and beat until well combined. 2. In a small bowl, smash bananas with a fork or potato masher and add to other combined ingredients. Add rolled oats. Beat until very well combined. 3. Pour mixture into a prepared loaf pan. Bake for 45 minutes, or until top is firm and browned. Remove from oven and let cool in pan for 5 minutes. Transfer to wire rack and let cool completely before slicing. Right, so not the best of ideas, but I needed to spend some time inside after my insanely hot run this morning. Plus, I haven’t baked tried to bake anything in a while. 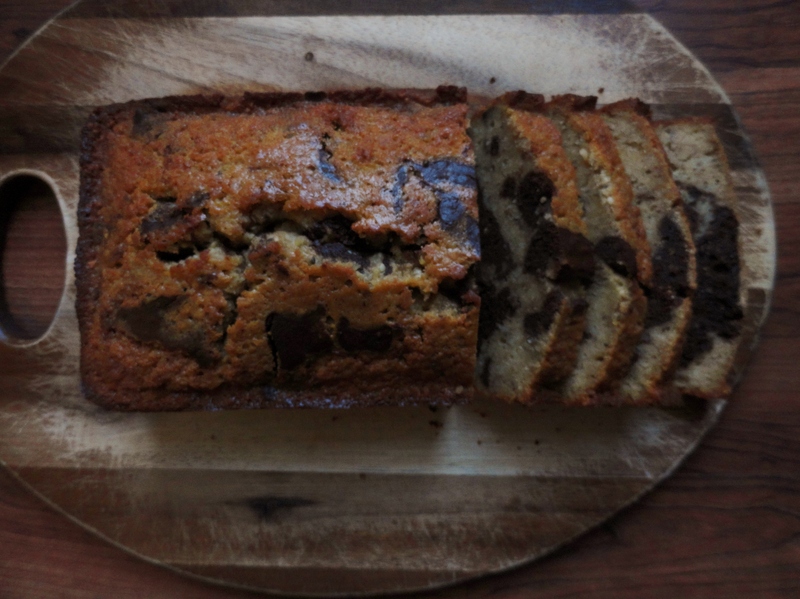 I had a brown banana I threw in the fridge last week, so I’d had baking on my mind for a few days. My original intent was to make banana bread with strawberries, so I could use up what I already had. Plus, I only had one banana and I thought the bread would need a little more flavoring. Well, the strawberries had seen better days, so they made the fateful trip to my compost bin. But, I did have blueberries, so I figured, why not throw those in there. Additionally, I still had a cup of rolled oats from my whole wheat pancakes with oats and strawberries, so why not throw those in the mix too. I had my loaf pan out, oiled and ready to throw my batter in there, but then it hit me. We aren’t going to eat an entire loaf of bread before it goes bad, why not make mini muffins and freeze half of them – although my freezer is seriously lacking any extra room right now. But, I’ve never used my mini muffin pan for making mini muffins, so I figured it was about time. I went off a basic banana bread recipe I had in my recipe binder, but honestly, I have no idea where it came from. I tried searching the web, but with no matches. Anyway, I altered it so much by using more milk, butter instead of margarine, adding oats, blueberries, vanilla extract, and cinnamon. I guess I really am becoming somewhat of a baker! 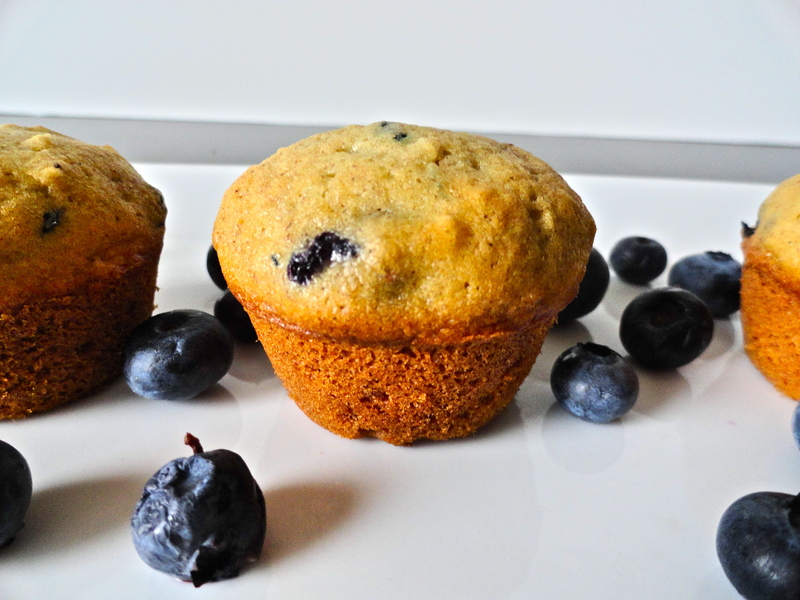 The muffins were fluffy and moist, and the blueberry-banana combination with cinnamon was a great touch, though I probably would have added more cinnamon next time. Speaking of bananas, does anyone think of the Gwen Stefani song whenever you spell it. “This sh*t is bananas, B-A-N-A-N-A-S.” Yeah, me either. 1. Preheat oven to 350 degrees. In a medium bowl, sift together flour, baking soda, baking powder and salt. 2. In the bowl of a stand mixer, cream sugar and butter together. Add in egg and mix until combined. Slowly add in dry ingredients. Once combined, drizzle in milk while the mixer is going. Add vanilla extract, cinnamon, bananas and 1/2 of the blueberries (I like to add only half of the blueberries now so some are broken and the blueberry flavor infuses the entire muffin, and then fold in the remaining blueberries so they are whole in the muffins). Fold in remaining blueberries and oats. 3. If using muffin wrappers, place those in the muffin tins. Otherwise, spray tins with olive oil. Fill each tin with about 1 tbsp of the batter and bake for 15-17 minutes, until muffin tops are brown and slightly crisp. 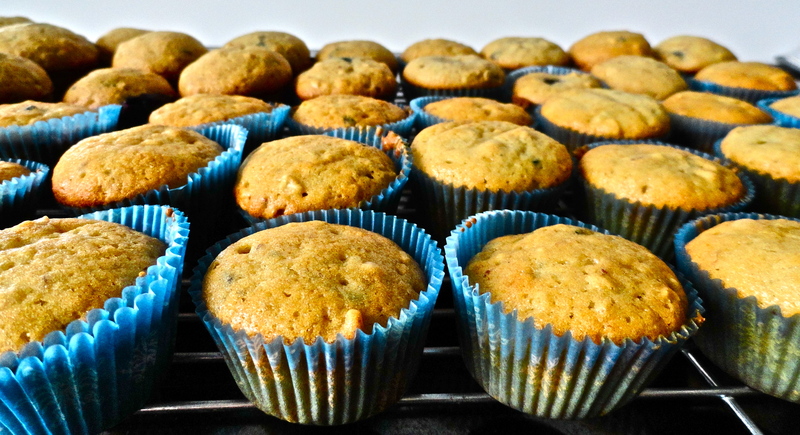 Remove from muffin pan and cool on wire rack.